1) Loving the Fall 2012 issue of The Studio Voice, which is a beautiful new publication from Amelia Maness-Gilliland. So delighted to be featured right next to my friend Jen Lee. Subscribe and find submission guidelines here. 2) The "Becoming" issue of Sprout Magazine is full of so much goodness. Amanda's online magazine looks gorgeous on my iPad. Looking forward to the December issue next week. 4) This week, I began a new ritual of reading one poem as I stand in the kitchen and drink the first few sips of my morning cup of tea. 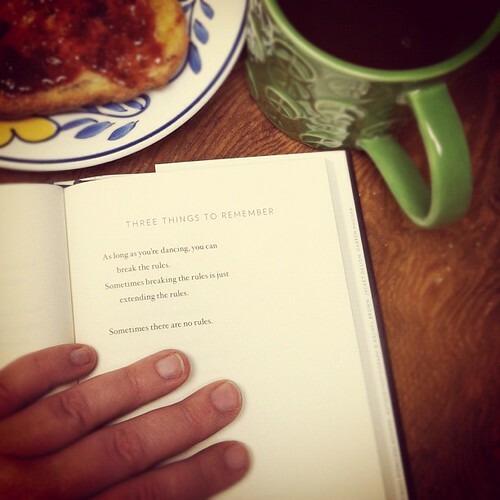 This week I've been exploring A Thousand Mornings by Mary Oliver and Red Suitcase by Naomi Shihab Nye. 5) And a few blog posts that have resonated lately: "When Being Seen Is An Inside Job" by Jen Lee, "Thoughts on Working from Home" by Jenna McGuiggan, and "As Loud As I Wanted" by Molly Wizenburg. 6) While freshening up my studio altar space and the books I keep beside it to turn to during the day, I spent some time reading through the essays in Lanterns. I love this little book and the essay I have in it remains one of my favorite things I've written. It's about how we can hold space for one another. The book is full of beautiful stories, poems, and photographs that celebrate connection with your kindreds. When I grabbed the link to Jenna's blog post that I linked to above, I noticed she's having a sale on Lanterns for those needing a last-minute gift for their kindreds. Learn all about it here. 7) Oh and you really should read Sam's monthly Bookishness column over on Chickadee Road. I smile through the whole thing every time and then add a whole bunch of goodness to my book wishlist.